LeBron James originally debuted this Nike LeBron 15 Low during All-Star Weekend, and now the colorway is officially set to make its debut. Dressed in a Multicolor, University Red, Black and White color scheme. This low-top Nike LeBron 15 features a Battleknit upper atop a speckled midsole, gradient Nike Swoosh and icy translucent outsole. Look for the Nike LeBron 15 Low “Multicolor” to release this March 2018 at select Nike Basketball retailers. The retail price tag is set at $150 USD. 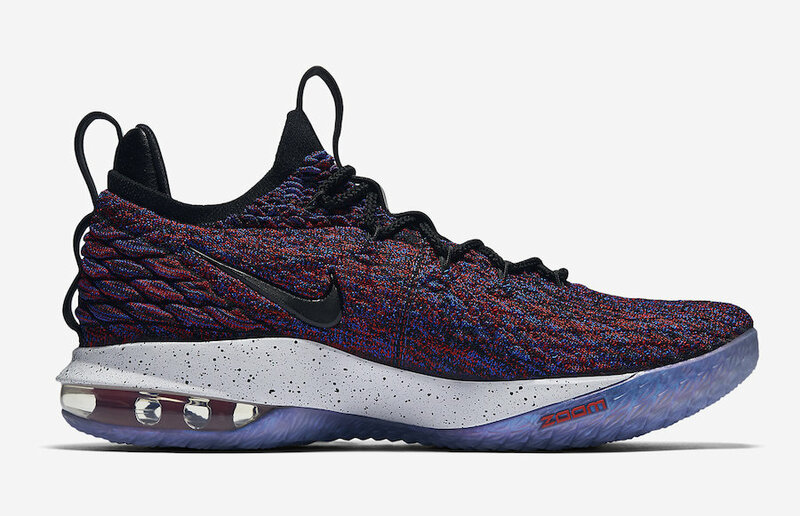 UPDATE: Dubbed, “Supernova” this Nike LeBron 15 Low is now available directly on Nike.com. Founder and Editor in Chief. My passion for sneakers started at age 6 and now I've turned my passion into a profession. Favorite Kicks - Air Jordan 3 "Black Cement"
Nike Planning to Release The Kith x LeBron 15 “Closing Ceremony” Soon? SBD provides millions of monthly visitors with sneaker updates on Jordan, Nike, Adidas, plus much more. SBD is quickly becoming one of the top sneaker sources on the web.